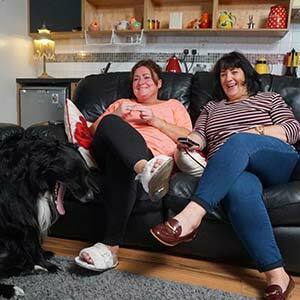 While the participants, the programmes featured in the show and even the programme's name changes for each local version of Gogglebox, one thing that remains constant is the turnaround time for each episode. When Gogglebox goes to air, the programmes that the participants watch and comment on need to be from the previous week's TV schedule - which means production teams all over the world have precisely one week to produce each episode. And that's a tall order. Creating moments of Gogglebox gold involves working with lots of participants in different locations, spread out over big geographies, and high shoot ratios that translate into long hours in post-production. There's no one-size-fits-all solution to making that happen within a one-week workflow. Original show creators, Studio Lambert, did create a guide to producing the award-winning format. The Gogglebox bible documents the workflow and technologies that they relied on to create the first series - including how they used cloud video platform, Forscene, to increase their efficiency in edit and cut down on time spent in post-production. But, like the stars of the show, each version of Gogglebox has its idiosyncrasies which affect the workflow. While all three local producers of the Gogglebox format have chosen to include Forscene in their workflow, each of them does so at a different stage in production, and in a very different way. Kite Entertainment has been producing entertainment, factual, comedy and kids TV for local and international broadcast since 2004. The Dublin-based production company completed the first series of Gogglebox Ireland for TV3 in December 2016. The show has proven incredibly popular amongst Irish audiences and a second series has been commissioned for 2017. Kite Entertainment decided to tackle the problem of high shoot ratios at the source. Typically, Gogglebox camera crews record a lot of footage where very little is going on so that they can catch the big reactions or funny interactions when they happen. These high shoot ratios affect time spent on all activities down the line - particularly on transferring and storing media and post-production. The Irish producers developed their workflow to be as efficient as possible on the shoot - only showing participants key moments from the programmes during recording to cut down on the amount of footage they generated. Editing the programmes that the participants would watch during recording meant investing some time up-front. Approximately five hours of programming was recorded each day at Screen Scene post house in Dublin, ingested onto Avid storage and then automatically transcoded and uploaded to the Forscene cloud. The production team could then log into the Gogglebox Ireland Forscene account using any computer or device over a standard internet connection and started cutting down the material. Each programme was reduced to between two and twenty-five minutes in Forscene - just enough to establish the story and get to the part that the producers believed would elicit interesting reactions from the households. These segments were then cut together and published as an MPEG 4 from Forscene, before being compressed further and shared via FTP with the field teams. The field teams downloaded the sequences and played them out on a laptop which was linked via HDMI to the participants' TVs for the shoot. The team recorded five days a week with thirteen households all over Ireland and turnaround time between the programmes being recorded and shown to participants was often as little as 24 hours. At the end of each shoot day the footage from that day's recordings were driven back to Screen Scene for post. "Forscene was an invaluable tool during the production," said Karen Reen, production manager at Kite Entertainment. "It improved our workflow and saved us valuable time in the field and during post." Marjan TV Network is a UK-based company that owns and operates Manoto - a free-to-air Persian-language channel. They created Bebin TV - the Farsi version of Gogglebox - and broadcast the series to audiences in Europe and the Middle East for the first time last year. The show featured Persian participants from both the UK and Canada and programming from the Middle East. The already-challenging Gogglebox turnaround time was compounded for the producers of Bebin TV because their production workflow spanned four time zones every week. In addition to shooting across two continents, the production team chose to use offline editors in both Vancouver and London, with finishing taking place in London before the programme was broadcast. With such vast distances between shoot locations, offline editors and finishing - the team at Marjan TV Network decided to implement a cloud-based post-production workflow that would centralise access to both the shoot footage and the edit sequences - cutting out any delay between the production, post and broadcast. The team filmed five days a week across 20 different locations in Manchester and Toronto, generating approximately 120 hours of media for each episode. At the end of each day's shoot they would use virtual servers to upload the rushes from both shoot locations to the Forscene cloud. This media was then accessible to their two editors in London and a third editor in Vancouver. The editors could immediately start their offline edit in Forscene, while the full resolution media was transferred back to the London-based operations centre via Signiant. Once the offline was complete and the full-res media had been received, the team moved the edit to Adobe Premiere Pro, via XML, for the online edit in London. Finally, the programme was broadcast via satellite back to the Middle East, and globally via web streaming through Manoto. "We selected Forscene to centralise our editing due to its fast media upload and edit capabilities," said Owain Dain, post-production producer at Marjan TV. "Forscene allowed us to start editing immediately after the shoot, enabled 24-hour post-production with editors working across different time zones, and provided me with the ability to check in on edits, from anywhere in the world, on my laptop. I believe we wouldn't have been able to pull off this production without it." Studio Lambert is a fast-growing independent television production company with an international reputation for making innovative and popular unscripted shows. It is part of the global production group, All3Media and has offices in both London and Los Angeles. The company was launched in 2008 by Stephen Lambert, creator of many well-known global formats including Wife Swap, Secret Millionaire and Faking It. The original creators of the format, Studio Lambert has used Forscene to speed up post-production of Gogglebox since production began on the first series. Producers use Forscene to find and select the best moments from the rushes while editing is in progress on the observational documentary. Studio Lambert shoots about 150 hours of material a week and logs the footage live during filming. As soon as filming wraps each night, the footage is driven straight back to Studio Lambert's post-production house in central London, where it is ingested into the Avid nonlinear editing system and automatically uploaded to Forscene so that it is ready for the edit team to start work the next morning. Edit directors and senior producers use a combination of shoot logs and Forscene during the edit to locate the best clips to weave into the show. "Forscene doubles the efficiency of the editing process," said Chantal Boyle, executive producer at Studio Lambert. "Whilst an editor is pulling material on the Avid editing system, the producer can pull different material and even create sequences simultaneously on Forscene, saving significant time in post." One show, three different workflows. Gogglebox just goes to show that there really are no two programmes that are exactly alike - no matter how similar they may seem. And there's always a way to make your workflow more efficient.